Before choosing Galapagos Land Accommodations, select the islands where you want to stay. If taking a land-only trip, I recommend splitting your time between Santa Cruz, staying in Ayora, and Isabela. Then you must decide if you want a 5-star hotel with all of the amenities, a hostel, or something in between. Another big consideration is if you want staff that speak English at your Galapagos land accommodations. It seems that the smaller hotels and hostels, often those that cost a bit less, are Spanish speaking only. We chose a moderately priced hotel with English speaking staff, breakfast included, a courtyard, air conditioned and very clean but with no other amenities. I wish we’d had a pool at our Galapagos land accommodations, which likely would not have mattered if we had gone diving. Hotels with pools are generally higher end – 4- and 5-star. We stayed at Galapagos Suites, a small hotel, for our Galapagos land accommodations, and were very pleased with a large and very clean room. The staff was very helpful; breakfast was good and filling. The air conditioner worked very well and was necessary as it was quite hot. We had a balcony with a chair and hammock, but the hotel is a couple blocks from the harbor (a good thing as it is a bit less noisy) and the view is rooftops. It runs between $125 – $150/ night based on the season. The location was close to everything and we felt safer behind locked wooden doors and walls that enclosed a lovely garden patio for relaxing. For a little more you can get an apartment with multiple bedrooms at Blue House Galapagos as your Galapagos land accommodations, which is walking distance to town and there is a pool, but it has no air conditioning, and Galapagos is hot. 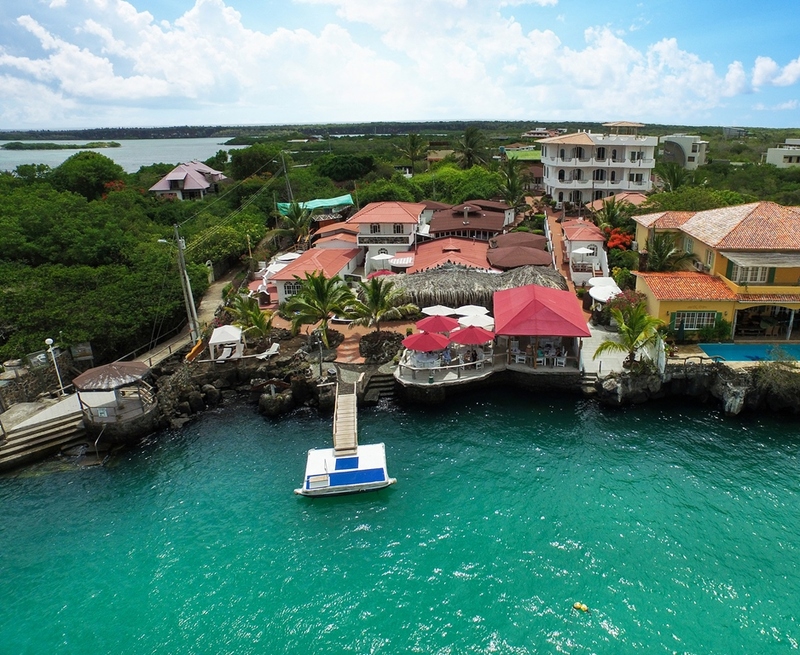 In Puerto Ayora, Santa Cruz you can choose from the high end hotels for Galapagos land accommodations, like Finch Bay Eco Hotel, which is accessible only by water taxi, and in a lovely quiet remote area of the harbor. To go to town, it is a walk to the harbor and water taxi across the harbor. Finch Bay Eco Hotel is a lovely hotel with a pool facing the beach, and lots of privacy. It is also quite expensive for Ecuador – even for Galapagos. I hear the rooms are small too. The people we know who stayed there, loved it. When I priced it for December 2015, it was over $500/night for a small room which was not ocean facing. However, it is a lovely setting. Other Galapagos land accommodations in that class include Hotel Solymar, which is in the middle of town, and on the harbor. The outdoor restaurant and pool face the harbor. It is a modern hotel; for an ocean-facing room, it is $400/night, and we did not find any staff who spoke English. The Red Mangrove looked interesting but I wasn’t sure if it would be buggy in the mangroves, and it has too many poor reviews about honesty. Still a very nice Galapagos land accommodation and just a little less expensive is Angermeyer Waterfront Inn. Our friends stayed there and liked it very much. It too requires a water taxi from the harbor to get to and from town, but people feel that is a charming part of the experience, and costs $1/pp. Apparently the rooms at the Angermeyer are spacious and gorgeous. Most rooms have a patio to relax in lounge chairs and watch the harbor activities; it is air conditioned; they have a safe. There is a lovely pool looking out onto the harbor. Prices are generally about $275/night plus tax, although this Galapagos land accommodation is often booked and it can be hard to get a room there. Hotel Pelican Inn is a small hotel, basic and clean, with a small pool on a side street. It is not secured from the street. The price is about $40 less per night than where we stayed; however my preference is a gated hotel, even though I wanted a pool. 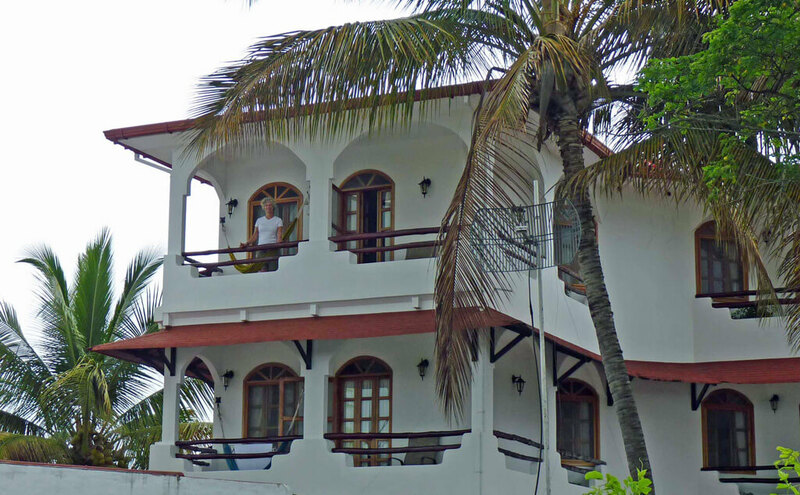 Galapagos land accommodations include many lower priced B&Bs and hostels to choose from; you can get a nice clean room with breakfast for 2 for $65-$75/night + tax, like Captain Max B&B, which people love, or Lava House Hostel. 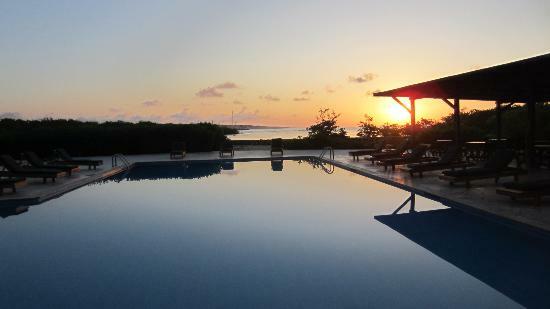 For $110+tax, people love The Galapagos Pearl B&B with its small pool. For even less money, most people like Galapagos Best Hostel where it is clean, has AC, and you can use the kitchen to cook. It is quite a walk from the harbor. Or you can get Galapagos land accommodations at a low rate under $40/night if you stay at Patty’s House, a 15-minute walk from the water. If you stay at Patty’s House, ask her to have a jug of water for you – $2. Had I known we were not going to dive, and if I had known more about Isabela in advance, I would have chosen to stay on Isabela for more nights than on Santa Cruz. It is less developed, and has an easily accessible big beach with lots of accommodations nearby, some overlooking the beach. It is much quieter and more laid back than Santa Cruz. There are also some day trips that I would have liked to have taken that are only offered from Isabela. Of course, I couldn’t tell any of this from the days/weeks of reading I did on the Galapagos and Galapagos land accommodations in preparation for our trip. Since we did not stay on Isabela, I cannot provide personal references for any of the Galapagos land accommodations there. However from visiting Isabela, I can offer some ideas about places to consider, and day trips that looked worthwhile. Iguana Crossing Boutique Hotel – probably the best hotel in the area, definitely looks like it from the outside. Location is great with easy access to beach, town and sights. If you stay at the port in Puerto Villamil, you can stay in a very nice B&B, La Casa de Marita, on the beach for $153 for 2 people including breakfast at high season. I would choose this one. Well priced in-town option – Hostal Rincon de George – looks average to me but people liked it at the $98 /night high season price. They say clean and comfortable, AC, good location, small fridge in rooms, breakfast provided, shared kitchen. Some say $25 pp, which may mean 4 people per room. Drake Inn – at the beach – looks nice, basic, with breakfast and a view. A few blocks from the city center, but there is a noisy bar next door – $100/night. If it weren’t for the bar next door, this would be high on my list! 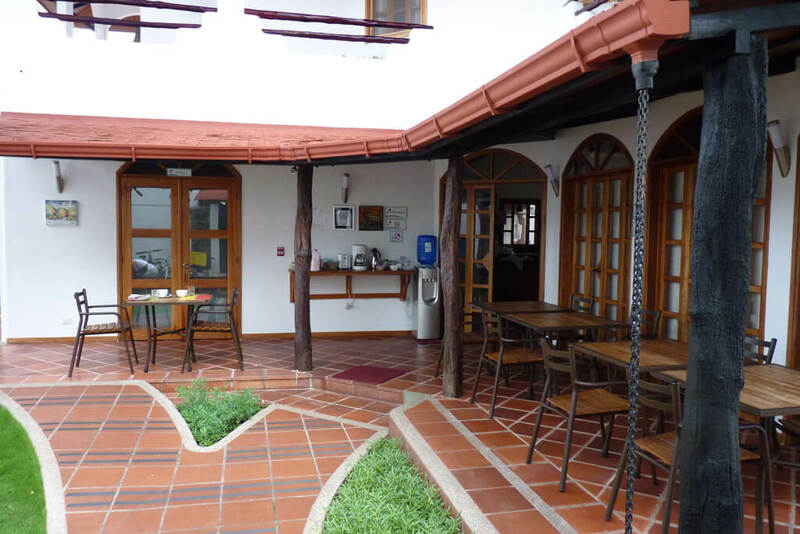 Hotel El Paraiso de Isabela – $73/night with breakfast for 2 – very basic – small, looks more like a hostel, good location and value. There are other budget hostels that got good marks for being clean and comfortable, like Hotel Sula Sula – very reasonable at $67/night with tax in high season. The downside is that it is a bit far from town, so you are rewarded with quiet nights. However, they don’t speak English. You can check out Casa De Chimarro, a home that provides small, clean rooms with private bath, great service, close to town; it is on the edge of town so it is quieter and close enough to walk – 5 min. While we visited 3 spots on and off the coast of Isabela on our cruise, our guide did not stop at Los Tuneles, a place I wanted to see – canals in the lava rocks with bridges and caves. Cactus grow on the rocks where many blue footed boobies nest and you can see many big turtles, rays, and fish in the sea water. Tours include snorkeling at a similar nearby site where sea horses and sharks can be seen along with eagle rays and turtles. On average, the cost is $60-$75 USD. Another spot to visit is Las Tintoreras – a lagoon where white tip sharks come to rest. You can take a water taxi at the docks. The price is about $3 pp USD. Don’t miss the tortoise sanctuary on Isabela. The beaches are large and inviting. NOTE: There is only one bank on the island but it closed so bring cash!!! No credit cards are accepted! There are lots of other places to stay if you want to research further. You’ll find tons of places on TripAdvisor, and what I have highlighted is a sampling of some of the better places in each class. If you can contact the accommodation directly, sometimes you can save more than through a booking website, and at times the cancellation policy is more flexible when booking directly. You may encounter Spanish speakers only when attempting to book directly; I chose accommodations where English was spoken also. This entry was posted in Ecuador, Galapagos, Isabela, Puerto Ayora, Santa Cruz, South America and tagged Accommodations, Excursions, Galapagos Suites, Homestays, Hostels, Hotels, International Travel, Land Adventures, Las Tintoreras, Los Tuneles by Wendy. Bookmark the permalink.